Lisa Ferrigno... When the music ends, the feelings last forever. Your first kiss. Your last dance. These are memories that deserve celebrating with a selection of wedding music that both reflects your distinct personality and love for one another and evokes powerful emotions that will last long after your final guest has gone home for the evening. Lisa Ferrigno has 20 years of experience helping brides create unique playlists for their wedding day. Be as involved as you like, from selecting each and every wedding song, to relying on Lisa’s experience to create your musical presentation for you, to a little bit of both. Looking for a string quartet or a mixed ensemble? No problem! With Lisa as your music director, she can put together any musical combination from string quartets to string trios, to strings with harp, piano, guitar, flute, oboe, and trumpet. 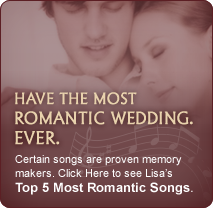 Lisa can help you find that perfect wedding sound you're looking for. And there's no limit to the selection of wedding songs you can choose from! It's your wedding day, it should be filled with music that is meaningful for you. Lisa is a classically trained violinist and can play the wedding songs that you want to hear on your special day. With Lisa’s creativity and expertise as a music director and talented violinist, your wedding will truly become an unforgettable experience with memories that will last a lifetime. Lisa's schedule fills up fast, so click here to reserve your wedding day! Planning an event? Lisa also performs at corporate events, holiday parties, and more! Click here to contact her today!